SUMMERVILLE, Ga. (CBS/AP) Tattooing six of their underage children with a jerry-rigged machine, using a guitar string as the needle, sounded like a good idea to Patty Jo Marsh and her husband Jacob Edwards Bartels at the time. 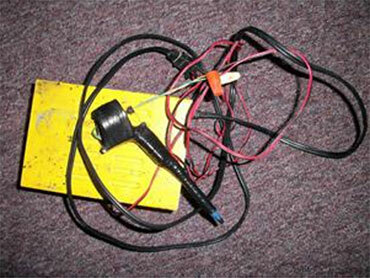 Photo: Tattoo Machine Used by Patty Jo Marsh and Jacob Edwards Bartels. But the Georgia pair failed to recognize the consequences of their ink-fest, and they were arrested late last year after the biological mother of two of the children complained the tats wouldn't wash off. Turns out Georgia state law prohibits both tattoos on children and those created by unlicensed artist. 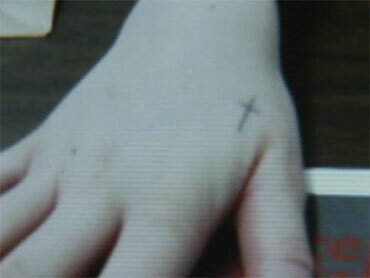 Photo: A Hand Tattoo Created by Patty Jo Marsh and Jacob Edwards Bartels. Marsh and Bartels were arrested December 28, and are charged with three counts each of illegal tattooing, second degree child cruelty and reckless conduct. Both bonded out of jail Friday evening on $10,000 property bonds each. Police say the "parents of the year" used a plastic pen body with a needle made from a guitar string connected to an electric motor to tattoo six children and themselves. Five children, ages 10 to 17, got a cross-like tattoo on their hands and a sixth had "mom and dad" inked on his arm — in honor of you know who..
Only the youngest child was ink-free. The Georgia Department of Family and Children's Services was called. All the children were placed with other family members upon the couple's arrest. Marsh says she gave the children tattoos because "they asked us to." "It's unusual," said Chattooga County Sheriff John Everett, to the city's local paper. "I've never seen parents tattooing their kids like that." "I'm their mother. Shouldn't I be able to decide if they get one?," Marsh said, according to The Atlanta Journal-Constitution, after being released from jail on bail. "They weren't hurt by them," Marsh said to the paper. "We would never do anything to hurt them….I don't understand why this is getting 'blowed up' so big."